Ringing in the Wedding Season with Marke! Meet Marke – a New York City-based company that specializes in handcrafted wedding bands. I discovered Marke on social media, and was immediately drawn to the simplicity and aesthetic of the bands and thought it'd be a perfect place to get Michael's wedding band. Upon perusing their seamless website, I loved how customization plays a huge role in the process – super important for choosing a forever band. Marke's wedding bands come in both Classic (a more rounded look) and Flat, with three different widths for each, three different color options for each, and two different finishes (Polish and Matte). I don't know about you, but that's all I ever wanted in a wedding band website. I've come across so many wedding bands (and websites), but struggled with one lacking factor whether it was the shape, the width, or the finish. With Marke's endless options, there's no doubt you'll find what you're looking for in a band. And the best part is? 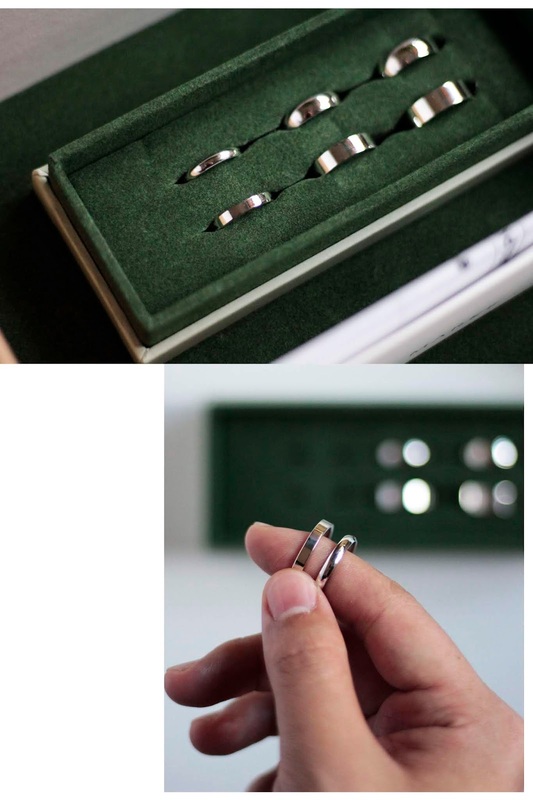 Marke manufactures their rings from factory straight to your doorstep, without the retail markup. You can rest assured that not only are these rings made with high quality materials, but they are also friendly on your wallet (especially with all the wedding planning going on)! If you're still on the fence about Marke, have no fear, for their Home Try-On Kit is here. Ever since Warby Parker, I've always been one to go for the home try-on option whenever possible. 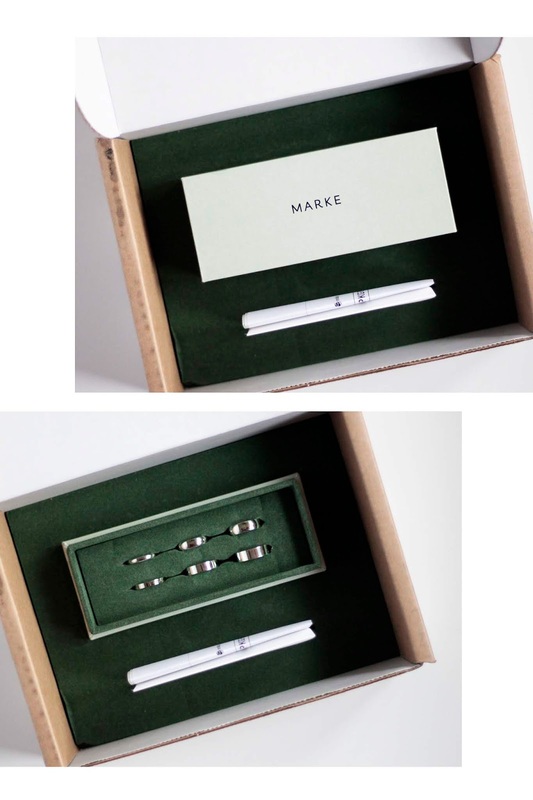 Marke's Home Try-On Kit includes six sterling silver replicas – three in Classic, three in Flat, in all three sizes for each. It also comes with a free return label, a ring sizer that you can keep, and more! This was really helpful for Michael and I, since we both had different visions for what his wedding band would look like. He wanted a thicker band in a polished finish and I wanted a medium-sized band in a matte finish for him. After the Home Try-On Kit, we both agreed that we liked the medium-sized Classic with a polished (shiny) finish for his band – we kind of met in the middle! Marke also offers personalized engravings for $50, which can be nice if you want to etch your wedding date or even your loved one's initials in there! We're so excited to receive our Marke wedding band for Michael. Though these bands are marketed more towards men, I feel like their Slim bands would be a great everyday essential for the ladies! We highly recommend checking out Marke for your future wedding bands. We know Marke will be the go-to brand we'd recommend to friends and family in the future. Months and months ago, I created a DIY Lavender Rose Body Scrub "recipe" for my best friend's Bridal Shower. Her bridal shower consisted of about forty people and I wanted to do a fun little DIY project that everyone could enjoy. I researched on dozens of ways to make a body scrub, and incorporated some of my own ingredients and ideas! It was fun sourcing ingredients, the glass jars, and custom stickers for this event! Keep scrolling for some DIY fun! I create this mini instruction sheet for each guest, as I think it's super helpful to be able to hear the instructions as well as follow along on the sheet in case you miss anything. Making body scrubs (or bath soak) is all about combining ingredients to your liking. For ingredients, I chose pink Himalayan salt, lavender buds, and dried rose petals. The one wet ingredient in this DIY is coconut oil. Wanted to give a huge shout-out to Kopari for sending some of their Organic Coconut Melt for Jane's Bridal Shower! I totally recommend investing when it comes to ingredients, like coconut oil. Kopari's Coconut Melt is so versatile and I knew it would be the perfect ingredient for this DIY. We melted some of the coconut oil in the microwave and poured the contents into short mason jars for easier access when scooping! We provided plastic cups for the mixing process, as it tends to get a little messy! First, add 4-5 scoops of pink Himalayan salt, and then desired amount of dried florals (lavender buds and / or dried rose petals). Personally, I like the smell of rose more than lavender, so I added more dried rose petals! Add 1-2 scoops of coconut oil! *Please skip this step if you prefer to make a bath salt / soak instead of a body scrub! Transfer contents into a glass jar! There you have it! Hope y'all enjoyed this fun DIY that's perfect for a girls' gathering, especially a bridal shower (and it works as the perfect bridal shower favor that they can take home). I'm currently obsessing over Jo Malone London's latest, Honeysuckle & Davana. You're right, when am I not obsessing over Jo Malone London? I'm all for all things honey and florals, and I had to give this fragrance a shot and now I'm swooning over it. Topped with Davana, with a heart of Honeysuckle and a Moss base, this scent is super clean and green at the same time, without being too overpowering in the sweet and floral realms. Honeysuckle & Davana definitely screams happy, yellow, sophisticated and chic all at once, and it's the perfect everyday go-to scent. This fragrance comes in both your standard Jo Malone London sizes as well as a candle! I had so much fun capturing sweet images of this fragrance along with Jo Malone London's The Talk of the Townhouse print (I'm a die-heard fan of print, still – something about flipping pages and tangibility still matters to me). Keep scrolling to see more! I'm excited to blend Honeysuckle & Davana with other fragrances, as it seems super compatible for fragrance combining! Speaking of... I might be that bride who goes out of her way to create a Jo Malone London scent for her wedding day... stay tuned! #TwoBecomeRen: My Bridesmaid Proposal Boxes! I've been engaged for about two months now and some days feel more surreal than others. Ever since I can remember, the thought of planning my own wedding always excited me, and the time has finally come. To be honest, some weeks are more productive than others, but I have faith it will all pan out as time progresses. At the end of the day, it really is just one day, filled with love from friends, family, and each other – we can't wait! This past weekend, I proposed to my bridesmaids and they all said "yes"! We met up for bottomless brunch at Avli Kafe, a cute Greek spot in Bayside, Queens. I loved putting their bridesmaid proposal boxes together and it was so fun watching them open their boxes! I painted each box's lid with their names on them and filled the boxes with a personalized card, photographs for old time's sake, a mini Moet, a cosmetic pouch with their initial painted on it, and some of my favorite beauty goodies! Keep scrolling to see an unboxing of one of these beauties! And a huge shout-out to the following brands for gifting product (or providing a generous discount) for these bridesmaid proposal boxes. I'm forever grateful. Show them some love! Stay tuned for more wedding planning details! Jo Malone London Does It Again With Their Queen of Pop Collection! As promised, I'm showcasing the next Jo Malone London collection, Queen of Pop - sooner than you thought, huh? Like I said, they've been kicking the year off with a handful of limited edition collections so far. and I'm not mad about it! They've recently launched their Queen of Pop collection this month, which is a curated collection from model / actress, Poppy Delevingne. This collection features three Bubble Baths, three Colognes, and three Home Candles, all in different scents. The scents are from Jo Malone London's everyday collection, but the packaging is decorated in bright pink with a random splash of stripes and / or polka-dots. I was able to receive one product from each category, plus the cute rubber duck from the collection (thank you so much, Jo Malone London)! I have the Bubble Bath in Black Cedarwood & Juniper, Cologne in Peony & Blue Suede, and a Home Candle in Blackberry & Bay! I'm most excited for the Bubble Bath because I haven't seen anything like it in a Jo Malone London limited edition (like the Hair Mist and Body Spray). Besides, who doesn't love bubble baths? I know the scent Peony & Blush Suede is a favorite of others, so I'm excited to finally own it - it's very floral and super appropriate for a night out on the town! And lastly, I'm loving the Blackberry & Bay Home Candle... this is one of my all-time favorite Jo Malone London scents and I'm ecstatic to own the candle version! If you're considering purchasing something from the Queen of Pop collection, just do it. Every product from this collection will make your space pop with summer vibes and positive energy.